If you’re looking for the EASIEST gluten-free dessert for the holidays, this gluten-free apple crisp is THE ONE! It only takes about 10 minutes to prepare and 40 minutes in the oven and you get this beautiful golden cookie-like crust over soft and fragrant cinnamon spiced apples. This is a great dessert to make if you’re short on time and want that wow-factor. Serve with a scoop of vanilla ice cream! Everyone will love this gluten-free dessert with a dairy-free and vegan option! Where in the world did October go? I feel like this month has been flying by. I mean Halloween is literally right around the corner! With only so much Fall time left, I feel like I need to get a move on my Fall festivities. Michael and I are continuing with our celebration of the fall season by carving pumpkins, making our own gluten-free pumpkin beer (yay!) and of course more apple recipes. Apple crisp has always been one of my go-to’s for an easy fall dessert. I can’t be the only person that buys bags upon bags of apples at the first sight of Fall and then wonder what to do with all that apple goodness before they go bad, right? You too? Okay good. We’re in this together. 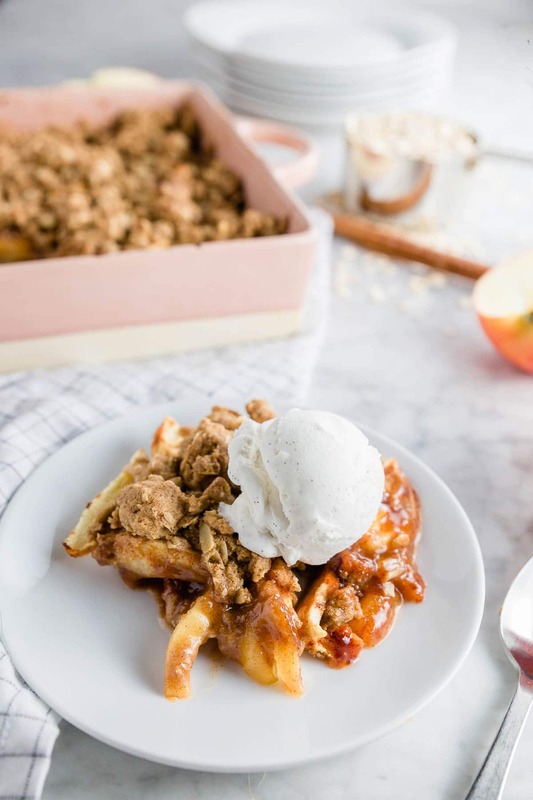 If you want the easiest, tastiest fall dessert, this gluten-free apple crisp is the one for you. It honestly could not be simpler to throw together. I have made this recipe SO many times that it’s a family favorite for the holidays. In fact, my mom just asked me if I was bringing it for Thanksgiving this year. You be it will be on that dessert table! This recipe is tried and true and has never failed me yet. It’s been made so many times that I even have variations for you guys that have been tested many, many times. There are two ways you can make this apple crisp – with a combination of gluten-free flour blend and oats OR just pure oats. I know for some, you may not have a gluten-free flour blend on hand, so I wanted to provide an all oat version for you, too. If you go with the gluten-free flour and oat combination, the top is more cookie-like than crumbled oats; It almost tasted like a ginger bread cookie on top of the apples. Which if you ask me is quite delicious and a welcome addition to any fall dessert. I mean… spiced cookie on top of apples? Yes please! If you go with the all oat version, it’s quite simple to do. All you have to do is make your own gluten-free oat flour. Add gluten-free certified oats to a food processor and grind them until they make a flour. Easy peasy! Oats are a hot topic in the gluten-free community. Conventional oats do not contain gluten per se, but are highly subject to contamination in the growing, milling, storing and packaging processes. Therefore, conventionally grown oats ARE NOT SAFE for people with celiac disease or gluten intolerance. If you have celiac disease or a gluten intolerance or are baking for someone who is gluten-free, you need to buy gluten-free certified oats, preferable those certified under the purity protocol, for this recipe. Remember, there are some people who still cannot tolerate gluten-free oats. You can leave the oats out completely if you prefer and just increase the amount of gluten-free flour lend in the recipe. You can also swap in some almonds or almond flour instead. What are gluten-free certified oats? Gluten-free certified oats are oats that are tested by a third party and deemed free from gluten under the FDA’s standard of 20 parts per million (ppm). However, that’s about all it says. It doesn’t mean that the oats are not grown in fields that also grow wheat or that gluten-free equipment is used in the processing of the oats. Often times, gluten-free certified oats are mechanically separated from wheat and barley and tested that all. While they may meet the under 20ppm standard, they still may not be free from wheat or other gluten containing grains. Meaning they are not safe for those with celiac disease. What are purity protocol oats? Purity protocol oats, on the other hand, are grown in a dedicated gluten-free field free from wheat, barley, etc. Companies that wish to sell oats that are considered “pure” under the purity protocol have to go through rigorous steps and testing to ensure their oats are safe for those on a gluten-free diet. Purity protocol oats are certified gluten-free, but they go beyond that making sure that the oats are free from gluten from seed to store. Everything from field to milling to shipping is evaluated by third parties. If you want to read more about purity protocol oats, check out this information from the Gluten Intolerance Group here. There are quite a few suppliers of purity protocol oats in the United States. Some of my favorites are GF Harvest, GF Jules, and Montana Gluten Free. Apples are easily one of my favorite fruits. They’re so versatile and they have a decently long shelf-life for produce. BUT THERE ARE SO MANY DIFFERENT KINDS!! Granny Smith, Cortland, Gala, Red Delicious, McIntosh, Honey Crisp.. how do you choose which apple is best? For a recipe like this gluten-free apple crisp, I like to choose a firmer apple that is slightly tart and a little sweet. You don’t want to chose an apple that is juicy ad softer for baking. You pretty much will end up with apple sauce, and not in a good way. So leave the Red Delicious for eating raw and the McIntosh for making some apple sauce, because we need a crispy apple for this apple crisp. My favorite is honey crisp because it’s firm, crispy and lightly sweet. Sometimes, I also like to go for a granny smith apple because a little tartness is always delicious, too. Cortland, Golden Delicious, and Pink Lady are also good options. Often times, when I’m baking with apples, I like to use a mix of different apple varieties to add even more flavor and textures to my apple desserts. This time around I used a mix of granny smith and honey crisp and it was absolute perfection! 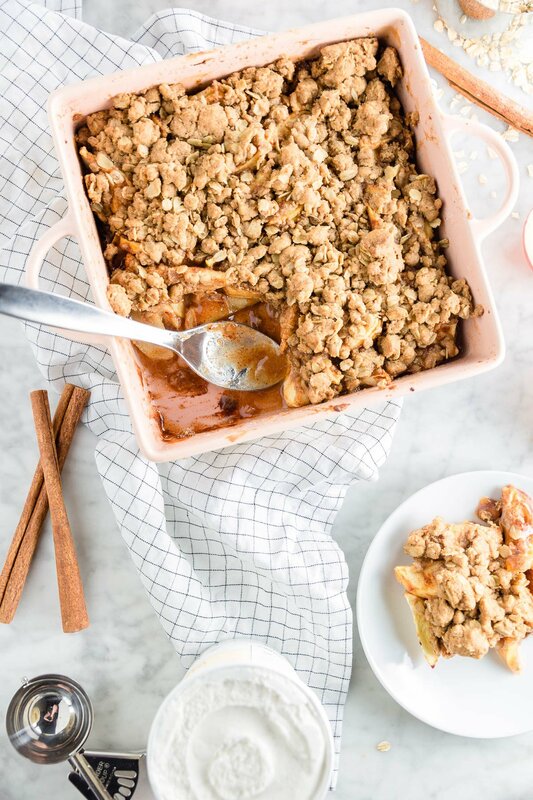 Gluten-free apple crisp makes such an easy dessert for fall entertaining. Ready in under 45 minutes, this apple crisp is so simple and so full of flavor. Serve warm with a scoop of ice cream for the perfect fall treat. Sweet, crisp apples are the star of this gluten-free apple crisp made with gluten-free oats. A crunchy, spiced crisp topping over cinnamon baked apples for a sweet dessert that's on the table in under 45 minutes. It's absolutely divine when served with a scoop of vanilla ice cream. It's so easy to make dairy-free and vegan, too! Place the sliced apples in an 8×8 inch baking dish. n a small bowl, mix together the granulated sugar, gluten-free flour blend, ground cinnamon, ginger, nutmeg, and cloves. Whisk to combine. Sprinkle the sugar mixture over the apples. Do not stir the apples. Pour the lemon juice and water evenly over the apples. It is okay if there are still some dry spots. In a bowl, mix together gluten-free certified oats, gluten-free flour blend, brown sugar, cinnamon, nutmeg, baking powder, baking soda, salt and melted butter. Crumble the oat topping over the apple mixture. Bake the apple crisp at 350F for about 30-35 minutes, or until the top is golden brown. Serve warm with a big scoop of vanilla ice cream. Store leftovers in the refrigerator covered with aluminum foil. **You can make oat flour by blending gluten-free certified oats (preferably purity protocol oats) in a blender or food processor until finely ground. Measure for the recipe after blending into a flour. Looks great! And thanks for the tip about grinding your own oat flour.